The clock hits 2:50. “¡Hasta mañana!” I speed-walk from Spanish to Hill College House, throw up my hair, briefly become a quick-change artist, and jog to fencing practice. I leave practice more than three hours later, much sweatier and disheveled than before, and I immediately hurry off to club meetings. Only much later do I return back to my room, to relax and work on assignments. It may sound like an overwhelming routine, but I love it. At Penn, everyone has multiple interests and hobbies, and balancing academics and extracurriculars is, in reality, very manageable if you pursue what you truly enjoy. Before coming to Penn, I wasn’t sure how I was going to juggle academics and a social life, let alone extracurriculars. However, after attending GBMs (general body meetings) for the clubs that interested me, I realized that extracurriculars would not only enhance my college experience, but also expand my circle of new friends and alleviate academic stress. 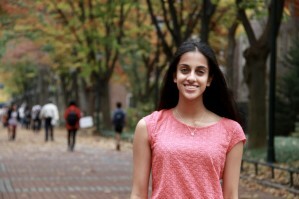 I ended up joining Wharton Ambassadors and the Wharton Undergraduate Research Board, and these clubs have become some of the highlights of my initial Penn experience. In high school, I really liked both mentoring and research, so being able to continue these activities at Penn has been a big plus. In high school, it is common for people to pursue a countless number of extracurriculars, in part to enhance those dreaded CommonApps, but here at Penn, there is no pressure to join every club; instead, people just pursue what they love to do. And, the same goes for Wharton academics. You have a wide range of courses you can choose from, and your schedule is, for the most part, customized and personalized. You are in charge of your routine, and learning how to make it productive is part of the freshman-year experience. Life at Penn is busy, but it is incredible and dynamic as well. After one semester as a Quaker, I am beginning to balance classes and extracurriculars in a way that is an enjoyable mix. I was a walk-on to the Penn fencing team, and although the practice schedule is intense, it has served as a much-needed break from purely cerebral activities. As a bonus, I’ve made new connections and friends, including upperclassmen who are more than willing to give me advice as I traverse my freshman year. Balancing academics and extracurriculars here at Penn may initially seem daunting, but with the right mindset and new peers, it can be both feasible and fun. Nithya Kasi (W19) is from New City, NY, and she is interested in pursuing concentrations in Marketing and Operations, Information, and Decisions (OIDD). Beyond academics, she is a varsity fencer, a member of Sigma Delta Tau, and a proud Wharton Ambassador. In her free time, she enjoys spending time with friends and watching Netflix (especially Friends).